The Old Paul Pry01263 715779work01603 870304fax Self-cateringThe Old Paul Pry, a former Ale house dates back from 1715, positioned just off the centre of the beautiful Georgian town of Holt, with its abundance of shops and galleries. The property has been extensivley refurbished and offers all the comforts of modern day living. • Utilities: Electric oven and gas hob, fridge, freezer, microwave, dishwasher, washing machine and tumble dryer. • Other: Books and games, Wifi available at The Folley Tearooms. • Outdoors: Sole use of fully enclosed courtyard garden at The Folley Tearooms between 20.00 and 08.00hrs, reserved table for the Old Paul Pry in quiet sunny corner during tea room's opening hours. • Access: None at property, owners will pay for one car to be parked in Albert Street car park for duration of holiday. A fabulous location and charming interior make this property an ideal choice for your break in Holt. The Old Paul Pry, a former Ale house dates back from 1715, positioned just off the centre of the beautiful Georgian town of Holt, with its abundance of shops and galleries. 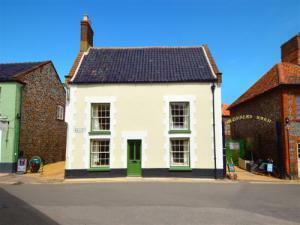 The property has been extensivley refurbished and offers all the comforts of modern day living.